Plus Special Award for "Roma"
At the State: Winner of The Un Certain Regard Award at The Cannes Film Festival! This film by director Ali Abbasi follows customs officer Tina, who is known for her extraordinary sense of smell. It’s almost as if she can sniff out the guilt on anyone hiding something. But when Vore, a suspicious-looking man, walks past her, her abilities are challenged for the first time ever. Tina can sense Vore is hiding something she can’t identify. Even worse, she feels a strange attraction to him. As Tina develops a special bond with Vore and discovers his true identity, she also realizes the truth about herself. "Rare Exports: A Christmas Tale"
This film plays Friday, December 7 at 9:30 PM at the State Theatre as a part of Late Nights at the State: Holiday Horrors. A young boy named Pietari and his friend Juuso think a secret mountain drilling project near their home in northern Finland has uncovered the tomb of Santa Claus. However, this a monstrous, evil Santa, much unlike the cheery St. Nick of legend. When Pietari’s father captures a feral old man in his wolf trap, the man may hold the key to why reindeer are being slaughtered and children are disappearing. This film plays Saturday, December 8 at 11:59 PM at the State Theatre as a part of Late Nights at the State: Holiday Horrors. Don’t get them wet, don’t expose them to bright light, and don’t feed them after midnight. These are the 3 rules one must abide by when taking care of a ‘mogwai.' But when young Billy is gifted one for the holidays, named Gizmo, he learns that when these rules are broken, Gizmo spawns a gang of gremlins that decide to tear up the town on Christmas Eve. From Director Joe Dante and written by Chris Columbus ("Home Alone," "The Goonies"). Tickets are only $8! The Holiday Classic Film Series presented by Old National Bank and Sesi Lincoln continues this week with this film, which plays Sunday, December 9 at 1:30 PM at the Michigan Theater. Free and open to the public! This modern holiday classic comedy stars funnyman Will Ferrell as Buddy, a human who was raised as an elf and thus struggles to fit in. So, when Buddy discovers his true identity, he sets off to New York City to meet and form a relationship with his biological father, a cynical businessman played by James Caan, with increasingly chaotic results. In the Big City, Buddy learns that the real world is not as magical as the North Pole but remains determined to spread Christmas cheer. Also stars Ed Asner, Mary Steenburgen, Zooey Deschanel, and Bob Newhart. 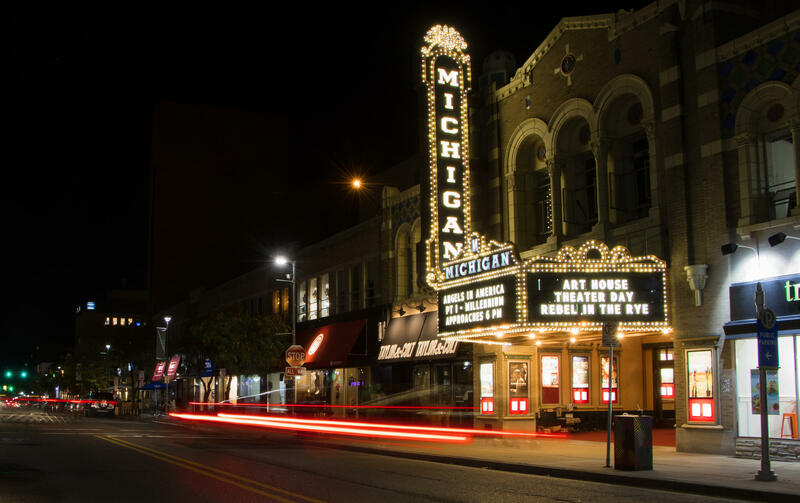 "NT Live: The Madness of King George"
This film plays Sunday, December 9 at 7:00 PM at the Michigan Theater, presented in partnership with UMS and broadcast live in HD from the National Theater, London. Written by one of Britain’s best-loved playwrights Alan Bennett, this epic play was also adapted into a BAFTA Award-winning film following its premiere on stage in 1991. The cast of this new production includes Olivier Award-winners Mark Gatiss ("Sherlock," "Wolf Hall") in the title role, and Adrian Scarborough ("Upstairs Downstairs"). It’s 1786, and King George III is the most powerful man in the world. But his behavior is becoming increasingly erratic as he succumbs to fits of lunacy. With the King’s mind unraveling at a dramatic pace, ambitious politicians and the scheming Prince of Wales threaten to undermine the power of the Crown, and expose the fine line between a King and a man. Ingmar Bergman’s final film, which received only a limited release in the United States, plays Tuesday, December 11 at 7:00 PM at the State Theater. Following Johan (Erland Josephson - "Fanny and Alexander") and Marianne (Liv Ullmann - "Persona," "Autumn Sonata") 30 years after the events of "Scenes from a Marriage," this sequel finds the couple long since divorced and remarried. After Johan separates from his second wife, and Marianne loses her second husband, the ex-lovers try to reconnect. Meanwhile, Johan's son, Henrik, is having problems of his own with his daughter, Karin, a cellist whose career plans don't match her father's expectations. To commemorate the 25th anniversary release of Steven Spielberg's masterpiece, one of the most significant endeavors in the history of cinema, Universal Pictures will re-release the film with picture and sound digitally remastered for a limited theatrical engagement on Friday, December 7, in theaters across the United States and Canada. Winner of seven Academy Awards, including Best Picture and Best Director, this incredible true story follows the enigmatic Oskar Schindler (played by Liam Neeson), who saved the lives of more than 1,100 Jews during the Holocaust. It is the triumph of one man who made a difference and the drama of those who survived one of the darkest chapters in human history because of what he did. Meticulously restored from the original film negative in pristine high definition and supervised by Spielberg, this is a powerful story whose lessons of courage and faith continue to inspire generations. The most personal project to date from Academy Award (R)-winning director and writer Alfonso Cuarón ("Gravity," "Children of Men," "Y Tu Mama Tambien"), this film follows Cleo (Yalitza Aparicio), a young domestic worker for a family in the middle-class neighborhood of Roma in Mexico City. Delivering an artful love letter to the women who raised him, Cuarón draws on his own childhood to create a vivid and emotional portrait of domestic strife and social hierarchy amidst political turmoil of the 1970s. Cuarón's first project since the groundbreaking "Gravity" in 2013, it will be available in theaters and on Netflix later this year. Written and directed by Alfonso Cuarón. Early 18th century. England is at war with the French. Nevertheless, duck racing and pineapple eating are thriving. A frail Queen Anne (Olivia Colman) occupies the throne and her close friend Lady Sarah Churchill (Rachel Weisz) governs the country in her stead while tending to Anne's ill health and mercurial temper. When a new servant Abigail Masham (Emma Stone) arrives, her charm endears her to Sarah. Sarah takes Abigail under her wing and Abigail sees a chance at a return to her aristocratic roots. As the politics of war become quite time consuming for Sarah, Abigail steps into the breach to fill in as the Queen's companion. Their burgeoning friendship gives her a chance to fulfill her ambitions and she will not let woman, man, politics, or rabbit stand in her way.